Not since the summer of 1996, when "Jurassic Park: The Ride" opened at Universal Studios, have amusement park fans looked forward to such an awe inspiring dinosaur themed attraction. 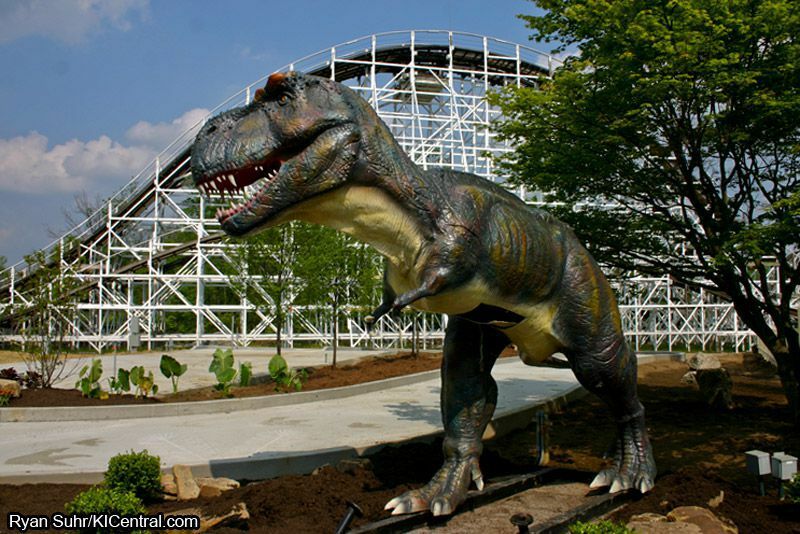 This coming Memorial Day, Kings Island will roll out its all new, one-of-a-kind walkthrough experience: Dinosaurs Alive! Today, KICentral.com brings you exclusive coverage of the attraction's construction. The attraction will feature 60 life sized dinosaurs, 56 of which have life-like animatronic motion. The biggest attraction along the trail will be the Ruyang Yellow River dinosaur which measures 72 feet long, 12 feet wide and an incredible 30 ft. high! In addition to the world's largest animatronic dinosaur park, Kings Island will be debuting "Dinosaurs Alive 3D!" in the park's Action FX Theatre. Viewers will be treated to a 10 minute educational film in stunning 3D on the theatre's massive screen. Dinosaurs Alive is available to be experienced at just $5.00, while Dinosaurs Alive 3D is available for just $4.00! A combo ticket to experience both can be purchased at a mere $7.00 per guest. Both exciting new attractions open May 26th! Be there or be extinct! I'm really looking forward to this. Thanks for posting! A 10 minute movie that is also free on youtube?!? For only 4 dollars?!?:!?! SIGN ME UP!!!! Jurassic Park the ride this is not. Great pictures, thanks for posting! Looks like they still have a lot of work to do over the next 14 days, when were the pictures taken? I would like to think the quality will be a lot better on the big screen. Also, it not Dolby 3D on your computer. It's a much different expirence when it's not on your computer. I for one will be paying the $7 the day it opens. Imagine seeing those dinosaurs on a huge screen. I'll pop in Jurassic park the movie on my 62" tv and pull up my computer chair and rock it when something intense happens. For free and I get all the popcorn I want. I did a quick search on You Tube for Dinosaurs Alive 3D, Dinosaurs Alive Kings Island, Dinosaurs Alive 3D Kings Island and Dinosaurs Alive 3D Movie Kings Island. None of those returned a result of the full movie, let a lone a ten minute movie being shown at Kings Island. Perhaps I didn't search hard enough or use the right words. good pictures it will be interesting to see how this develops. It would be nice if this were a precursor to a broader themed area development for #40 next year. Two other observations: Racer is really starting to resemble Top Gun, or whatever its called... in DIRE need of a decent paint job. It looks like they've painted it with a "flat-white-primer"
#2- they have never really found a decent use for the old Flight Commander pad. They just need to go in with a number of jack-hammers and grade that whole area. Nice pictures, thanks for adding! Has anyone seen the new dinosaur pop out on KI's website? Is that pathway supposed to be croocked? I would imagine them trying to keep costs down the first year as it's a pilot... and quite a bold move for an amusement park. I bet there will be more permanent structures added with the success of the attraction. I really think this will be a huge hit, hopefully profitable enough to finance an inverted B&M and a twisty GCI or GG woodie (and a re-profiled and rideable SOB (with the loop(dreaming, I know))). Let's hope. You gotta admit having a tent for the front entrance isn't exactly a vote of confidence for a long run. Maybe it's there just to provide a big "reveal" on opening day. Cincinnati.com has a nice photo gallery of DA... 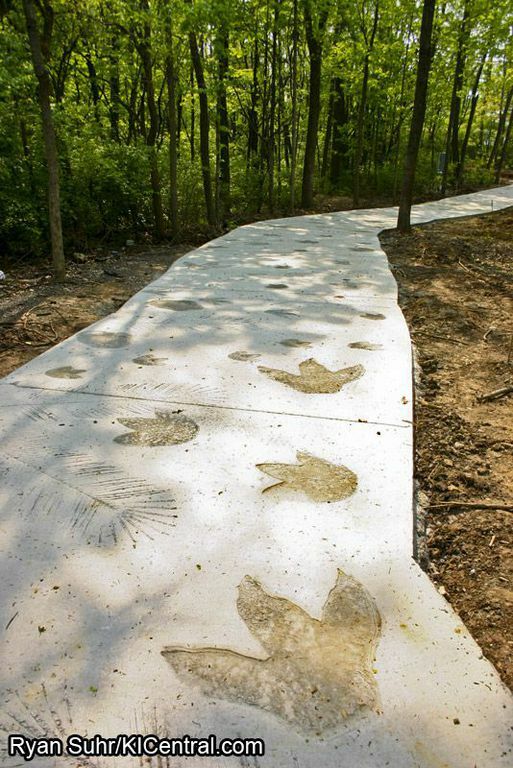 Photos: Dinosaurs Alive! According to picture 3 on the link provided, it is a gift shop. Still shows signs of here today, gone next year. And hope it can stand some windy days or there will be merchandise all over the place. So from all the pics I still do not see a trail. Will it be paved/easy access? What about strollers/wheelcharis? I started writing this yesterday and didn't get a chance to finish till today. I've come to a big decision, based off of reactions I've seen here and conversations with Avatar and others. I'm going to give CF and KI the benefit of the doubt from now on installations and upkeep. I feel like many on these boards are too quick to pass a negative judgment on things before they are experienced. I realize I bashed HPB without ever seeing the show but I still stand by what I said and don't believe I made an uninformed opinion. Remember how much negativity there was about WindSeeker? Now, I don't see any of those overly negative posters saying anything bad about it. As for the gift shop, what if they are trying to stay with a theme? Think about it this way: An actual building would not give the illusion of trying to track down dinosaurs, but a tent gives the illusion of a "base camp" of sorts: One that can pack up and be transported to the next spot as the animals naturally migrate. This is my favorite picture from the gallery posted a few days ago. If the construction workers weren't there, and the half assembled dinosaur on the far right, wasn't in the shot, then I'd swear this were out of a movie! Edit: The food items are sold at various locations around the park... The footlongs are sold at Coney Mall Skyline. For more realistic it would be camoflauge and such.